"I would cling to unhappiness because it was a known, familiar state. When I was happier, it was because I knew I was on my way back to misery. I've never been convinced that happiness is the object of the game. I'm wary of happiness." "I've always thought of Hugh as a panda, probably because he's not naturally aggressive. Either a panda or an Opel Kadett." 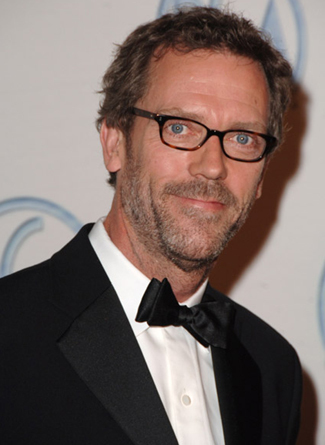 James Hugh Calum Laurie (born June 11, 1959), OBE is an English actor, comedian, writer and musician. He first reached fame as a cast member of Blackadder (particularly in season three and four, also known as Blackadder the Third and Blackadder Goes Fourth) and then as one half of Fry and Laurie in A Bit of Fry and Laurie. He also played Bertie Wooster in Jeeves and Wooster. Between 2004 and 2012, he starred as Dr. Gregory House in the show of the same name. He has since starred in a number of other American movies, including Street Kings and recently made a return to television with the Hulu series Chance. He's also an accomplished author, his book The Gun Seller being praised by critics. And on top of that, he's a multitalented musician, having released two well-received blues albums (and performing numbers as The Cast Showoff on many of his series) featuring his skills on vocals, piano, guitar, drums, harmonica, and saxophone. He has also done voice-acting, as Dr. Cockroach in Monsters vs. Aliens and some of its spinoff shorts, Steve in Arthur Christmas, E.B. 's Dad in Hop, Owl in Brown Bears Wedding, Squire Trelawney in The Legends of Treasure Island, Johnny Town-Mouse in The World of Peter Rabbit and Friends, and Newton in LittleBigPlanet 3. This leads to a strange dichotomy in his perception. To British audiences he is the comedic master of The Pratfall, the over-done and over-silly counterbalance to the more reserved Stephen Fry or Rowan Atkinson... but, to Americans, he is best known as the stern and cynical Dr. House. In fact—perhaps due to his uncannily flawless American accent—some Americans are surprised to learn that he's British. Including the casting director that hired him for the role. To some, he is a mixture of both, a man of legend perceived to be able to switch from cold and merciless to the most lovable man on earth in a single sentence. But wherever in the Anglosphere or indeed the world we are, he's still Hugh Laurie.